Mike Ditka wasn't the only Rookie of the Year in Pro Football for the 1961 season. Earl Faison was named AFL Rookie of the Year. The All American from University of Indiana was drafted by both the Detroit Lions and the San Diego Chargers. 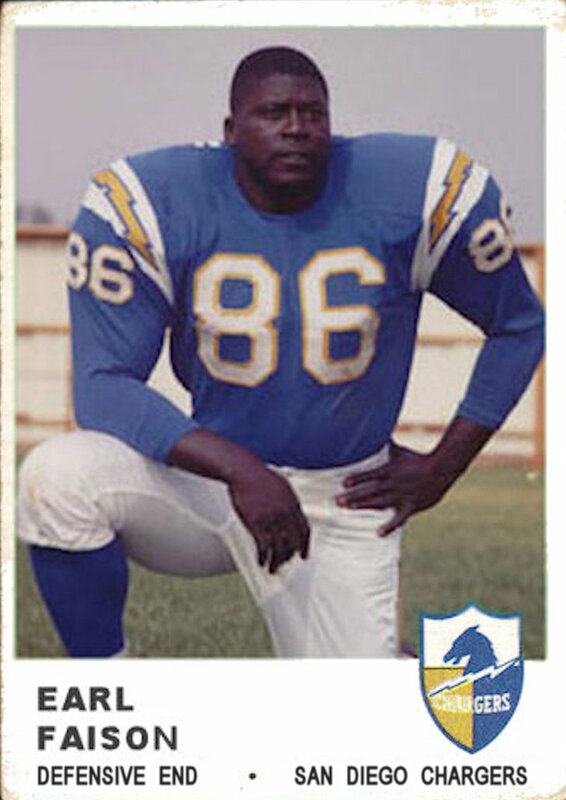 Although the Chargers were known for their offensive prowess, their defense had great nicknames. Faison and his linemates were known as the "Fearsome Foursome" and the backs were known as the "Seven Bandits". This was only the second year for the AFL and already the Los Angeles Chargers had become the San Diego Chargers. Just prior to its first year, the AFL lost one of its 8 charter members, the Minnesota Vikings to the NFL the other owners scrambled to add the Oakland Raiders to the league. It has been a while since I posted some of the missing Rookie of the Year football cards. 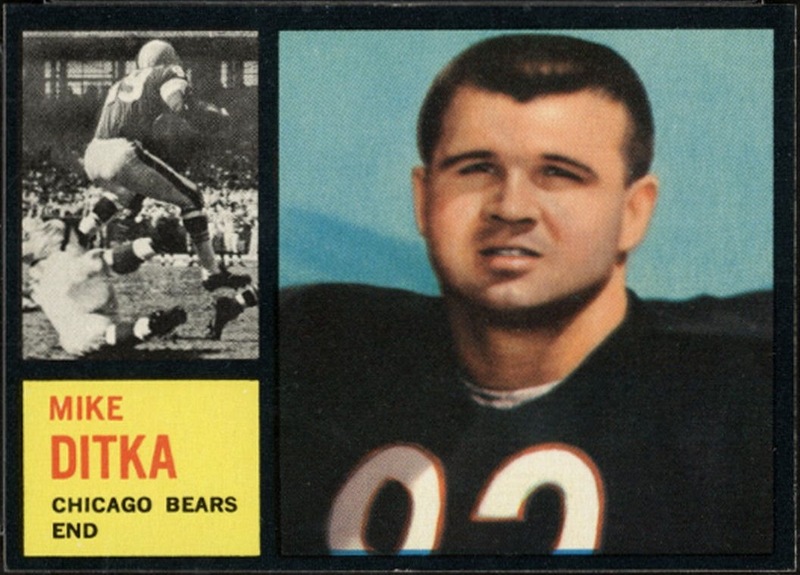 Here is the 1961 NFL Rookie of the Year, Mike Ditka. I don't think I need to go into depth on his Hall of Fame career as both a player and coach. But you might notice that he is not wearing his normal number 89. 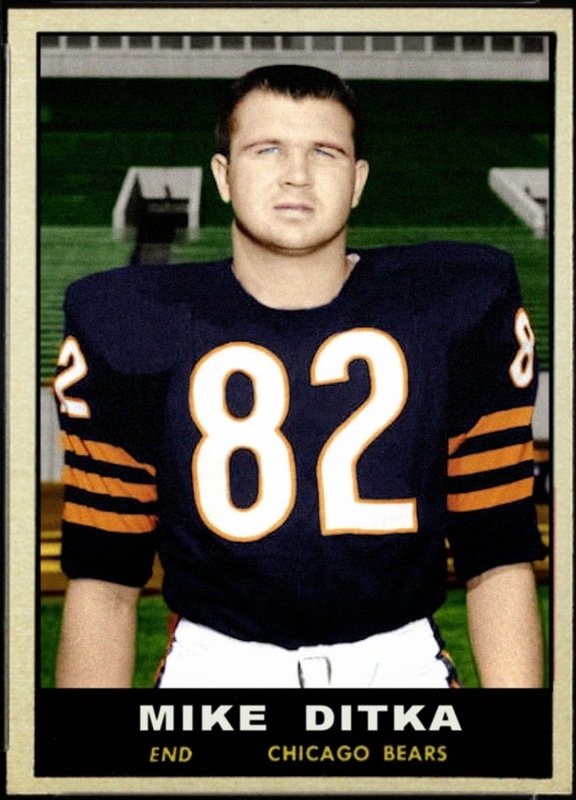 Ditka wore 89 at the University of Pittsburgh from 1958-1960 but was given the number 82 after being drafted by the Bears in 1961. The 89 uniform was being worn by kicker John Aveni. When Aveni was cut during training camp, Ditka was given 89 again. When the franchise retired his number last season they said it would be the last digits retired by the Bears. 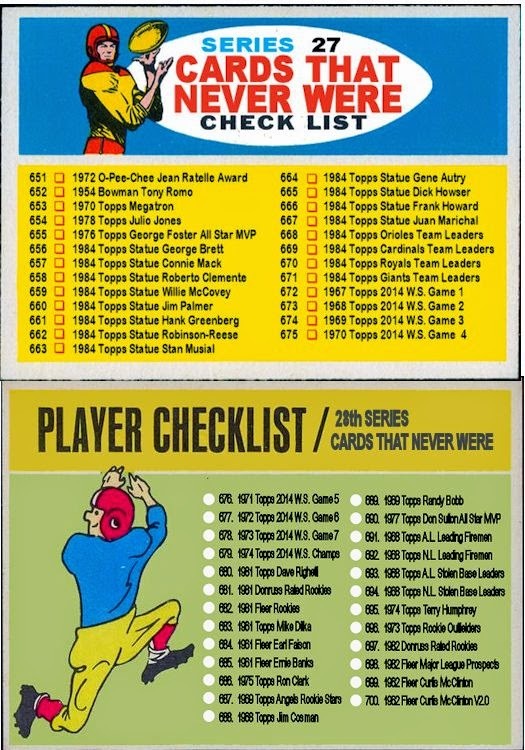 Even though 89 is the only number he wore as a Bear after his rookie training camp, you can see that Topps used a photo from the 1961 training camp on their 1962 card. 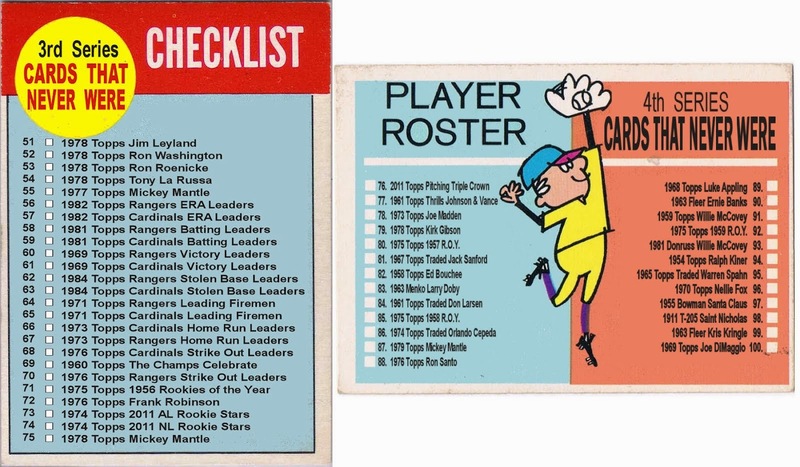 Here is a multi-player rookie card that would have fit right into the 1981 Fleer set. 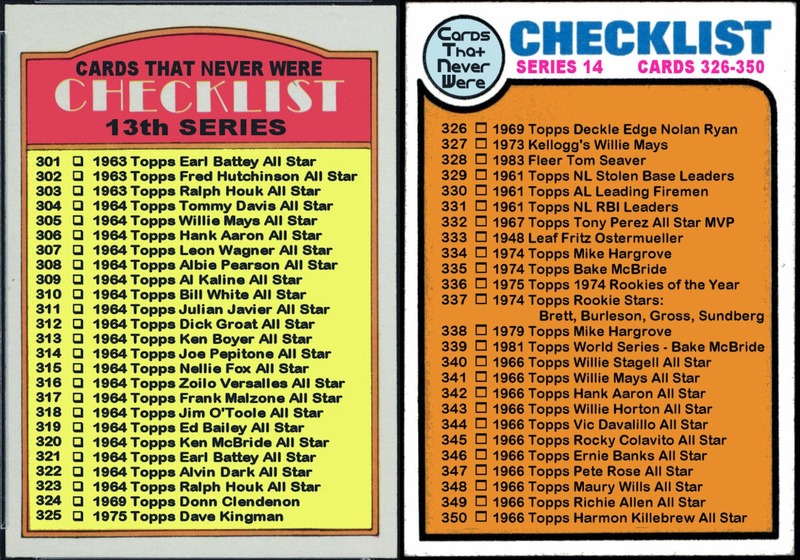 Coincidentally, it includes the 4 remaining Rookie of the Year candidates not included in any 1981 set or my last 2 posts. Shooty Babitt was a one season wonder. He began his MLB career hitting safely in each of his first 7 games. He ended his only MLB season with a .254 batting average. Although his playing career was short, he still remained on the scene. He was a scout for years with the Mets and the A's. This past season he was a color commentator on Comcast Sportsnet California. Brad Havens was one of 3 Minnesota Twins to receive ROY votes in the strike-shortened 1981 season. 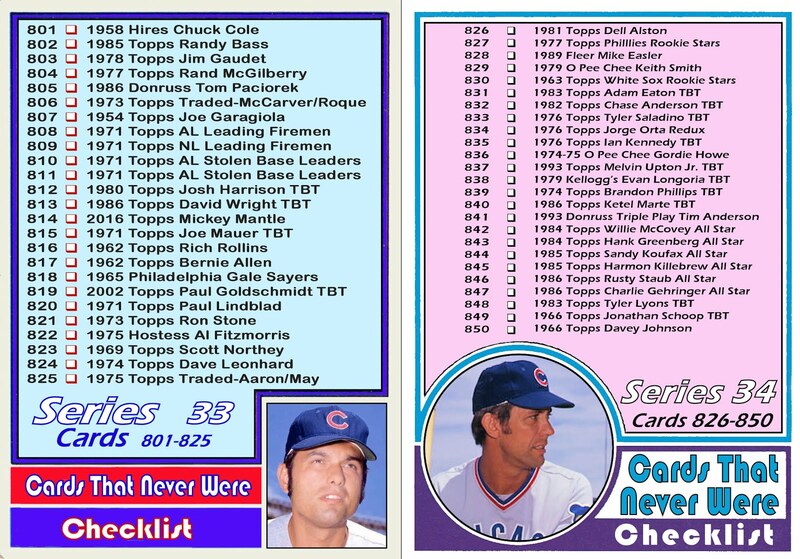 The other 2 were outfielders, Gary Ward and Dave Engle. 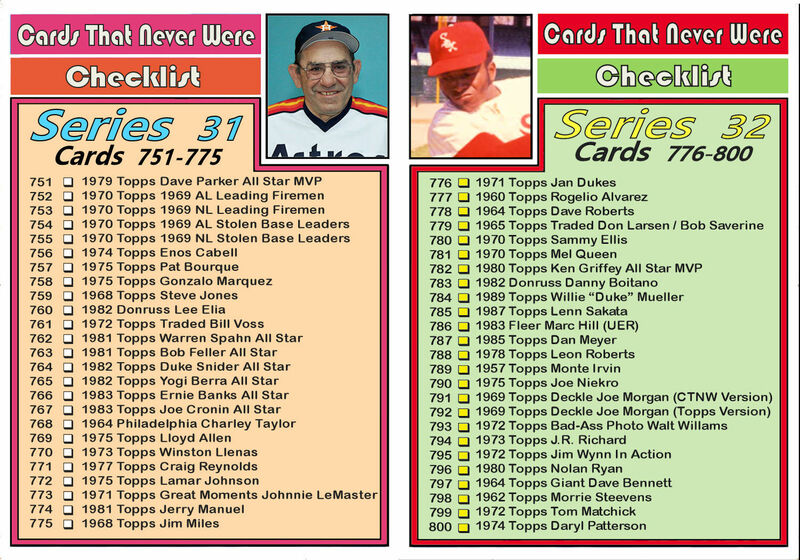 They appeared on the same "Future Stars" card in the 1981 Topps set. Havens was 3-6 in 12 starts for the last place Twins in 1981. He played for 5 different teams over his 8 season MLB career garnering a 24-37 record. Mike Witt led the league in hit batsmen in 1981 and posted a record of 8-9 for the Angels who finished 5th in the AL West. Witt would go on to have a solid career with the Angels. He was their opening day pitcher from 1985-1989 and was named to the All Star team in 1986 and 1987. Rich Gedman was named Sporting News Rookie of the Year in 1981. The Sporting News named separate ROYs for pitchers and position players from 1963-2003. He was Carlton Fisk's replacement in Boston after Fisk signed with the White Sox. Gedman spent 11 seasons as the Boston backstop. In 1981 there were 17 players receiving Rookie of the Year votes. 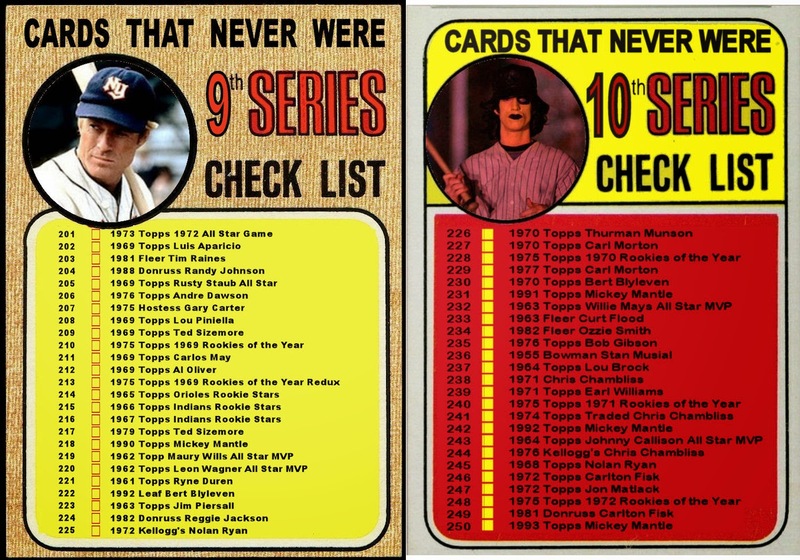 Topps managed to get 9 of them into the 1981 set. All of them on multi-player "Future Stars" cards. 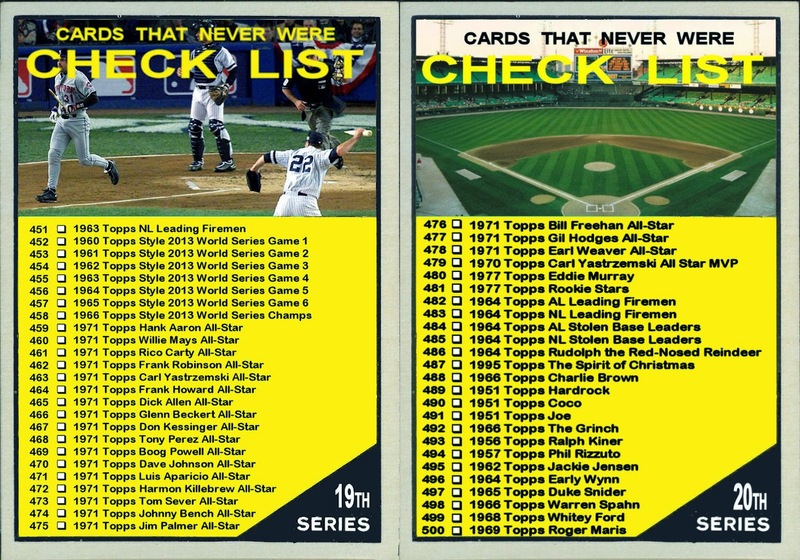 Donruss only managed to include 2 players. Tim Raines and Mookie Wilson. Both of them got their own regular issue card. 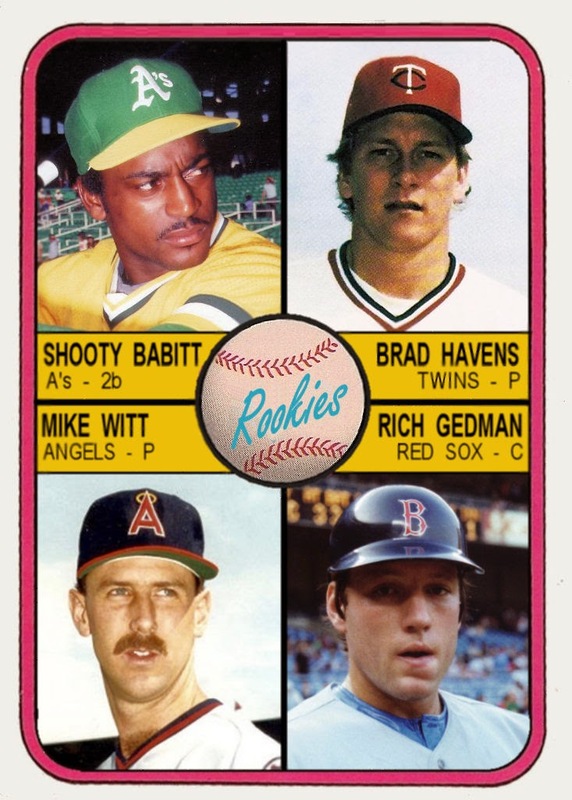 Had Donruss made multi-player rookie cards in 1981, they might have included more of these rookies. 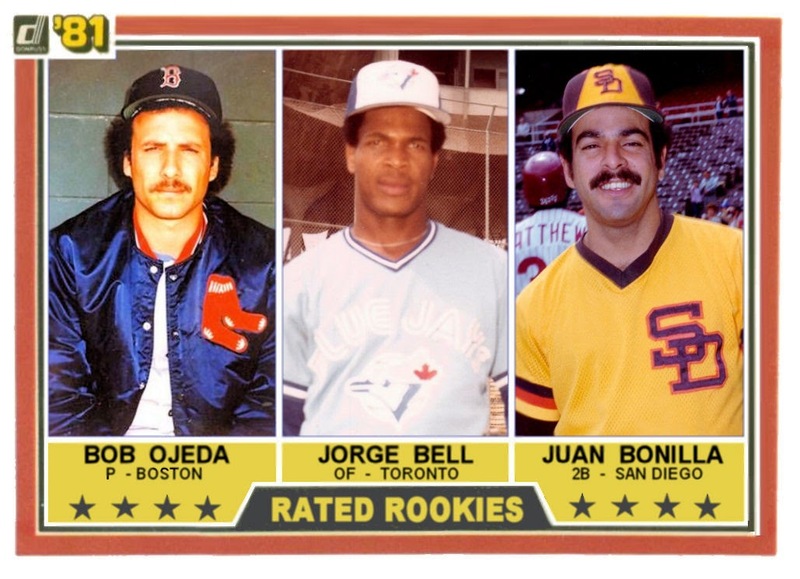 Donruss wouldn't make "Rated Rookie" cards until 1983. 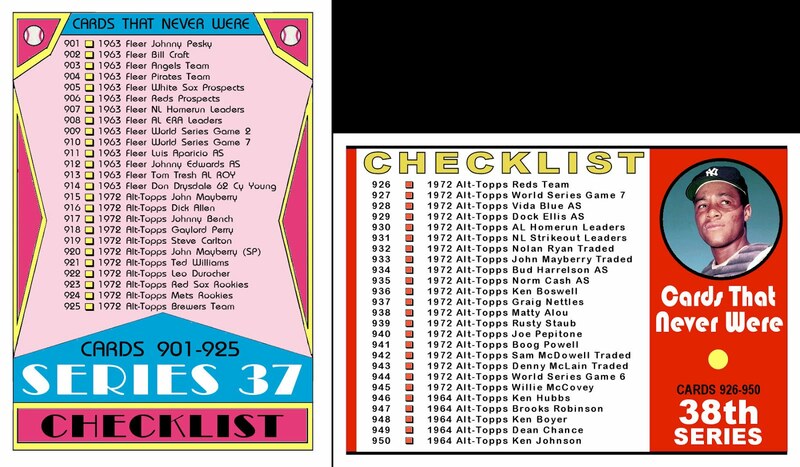 Here is what a multi-player Rated Rookie card from the inaugural Donruss set might have looked like. Bob Ojeda was 6-2 in 10 starts for the Red Sox in the strike-shortened 1981 season. That was enough to finish 3rd in AL voting. He went onto have a solid 15 year MLB career. A career that was perhaps shortened by a tragic boating accident. After going 6-9 for the Dodgers in 1992, Ojeda was traded to the Indians. During spring training, his new teammate Tim Crews took Ojeda ans Steve Olin boating and crashed into a pier. Crews and Olin were killed. Ojeda survived but missed most of the season recovering from both the physical and emotional injuries. He was signed by the Yankees for the 1994 season but was released after pitching just 3 innings. George Bell batted .233 in just 163 at bats in the 1981 season. Somehow that was enough to earn a couple ROY votes but not enough to remain on the Blue Jays' roster for the 1982 season. In 1982 he returned to the minors then was plagued by injuries and illness. It wasn't until 1984 that he became a regular in the Toronto line-up. In 1987 he was the AL MVP. 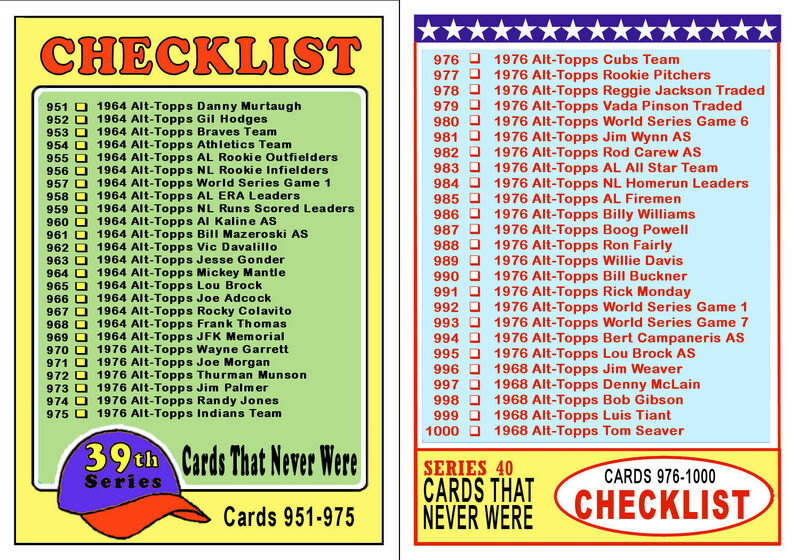 On this card I used the "Jorge" spelling of his name because that is what all the card manufacturers used in 1982. 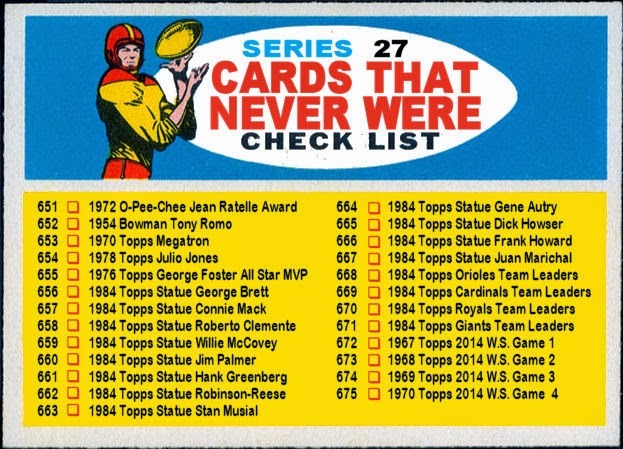 This despite the fact that his facsimile autograph on his 1982 Topps card is clearly spelled with a "G". 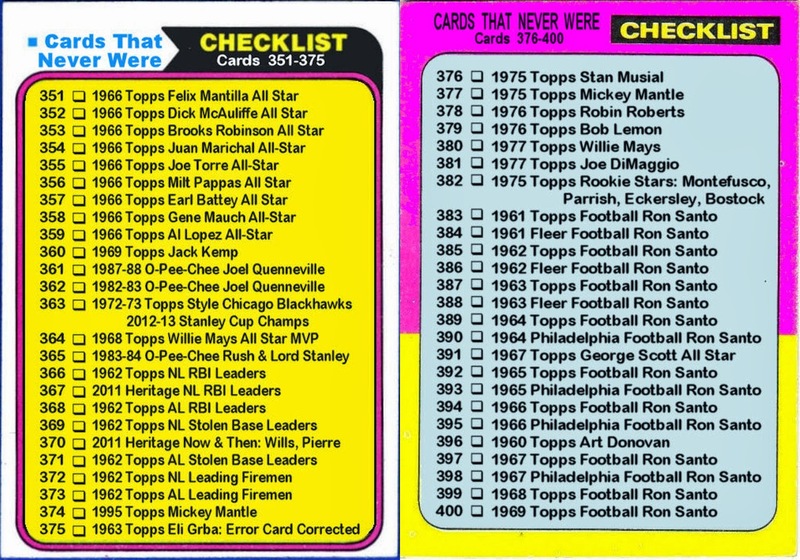 In 1984 Donruss began spelling his name with a "G". Fleer followed suit in 1985. 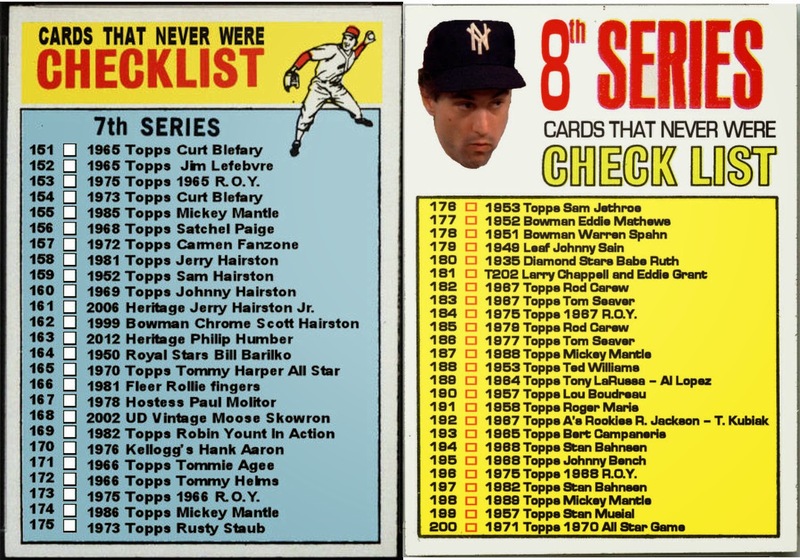 Topps finally used his preferred spelling in 1987. This is the same company that called Roberto Clemente "Bob" until 1970. Juan Bonilla had a career year his rookie season. He hit .290 and with Ozzie Smith at shortstop, Bonilla turned 72 double plays, 2nd best in the league. He was released by the Padres just before the 1984 season and sat out the whole season. In 1985 he was signed by the Yankees and spent most of the season playin AAA ball. By the end of 1987 his playing career was over. If you were watching the World Series you probably saw the Giants' pitching coach Dave Righetti. Lets face it, if you are reading this, not just looking at the pictures, you are as big a baseball geek as I am. So it is safe to assume you watched it. Well, Righetti was the 1981 A.L. Rookie of the Year. He went 8-4 in 15 starts for the pennant winning Yankees. He was also one of eight players receiving Rookie of the Year votes that did not have a card in 1981. This seem especially egregious since there were now 3 card companies to choose from. There were 17 players in 1981 who received Rookie of the Year consideration. 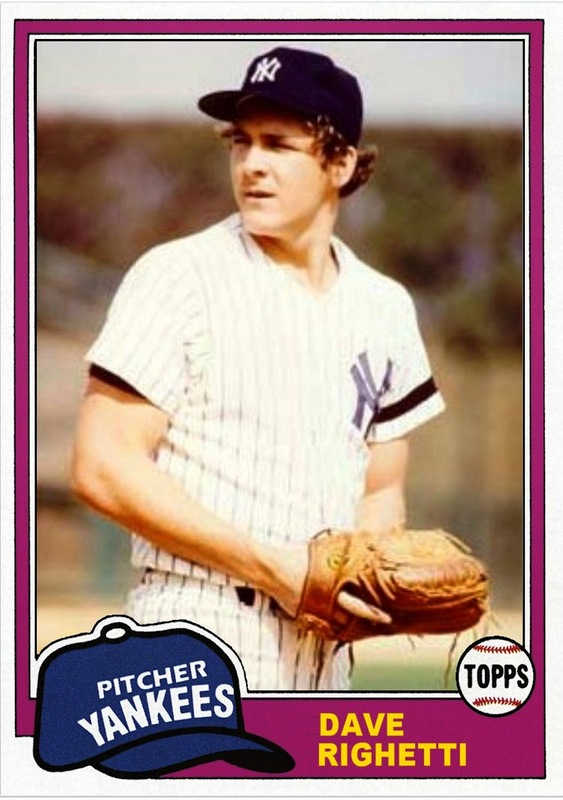 Of them only one appeared on a card in the 1981 Fleer set. The N.L. Rookie of the Year, Fernando Valenzuela. 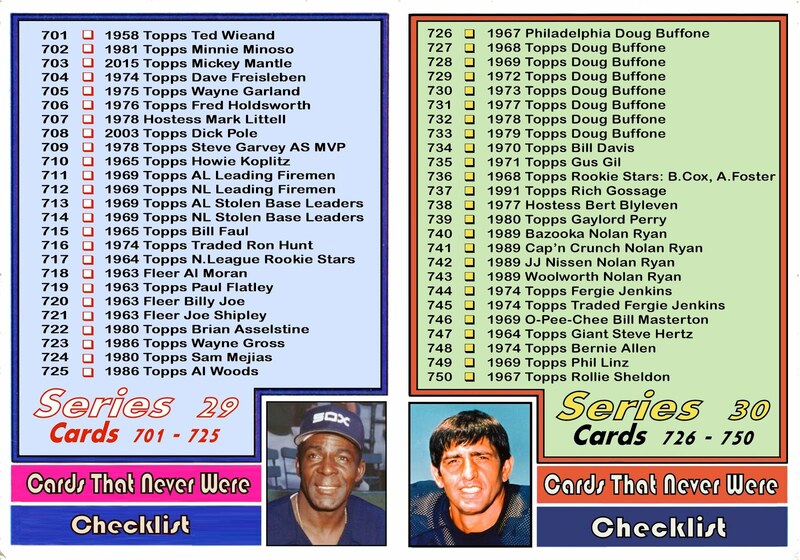 The 1981 Donruss set had two candidates, Tim Raines and Mookie Wilson. 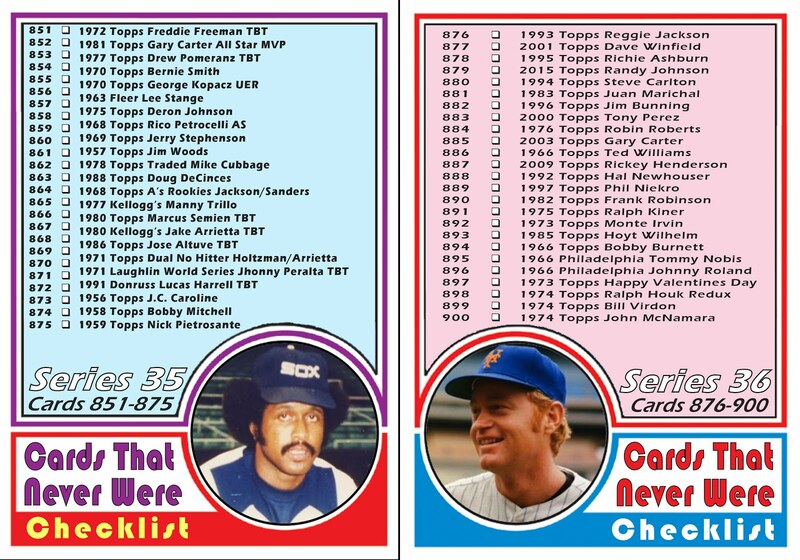 All 3 of these players also appeared in the 1981 Topps set along with 6 others to bring Topps total to 9 of the 17. 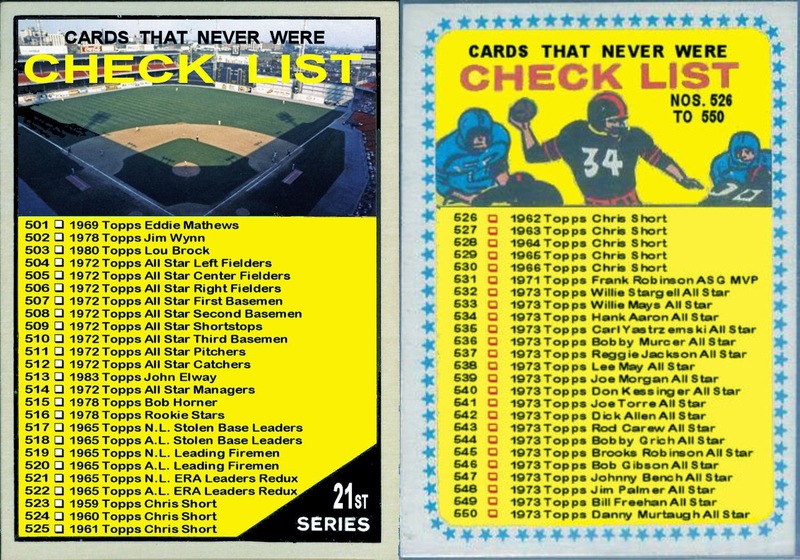 In the next couple posts, I'll be addressing the lack of rookies in the new-in-1981 baseball card sets. 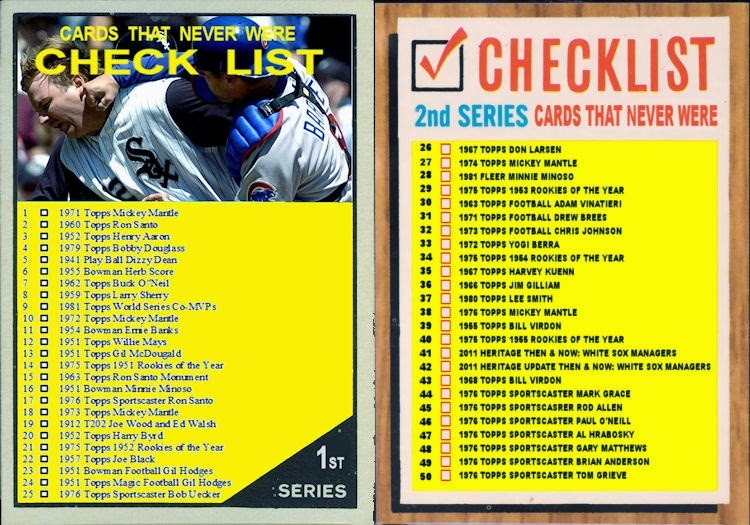 Another 25 cards in the books, another checklist. This one is taken from the 1957 Topps Football set. 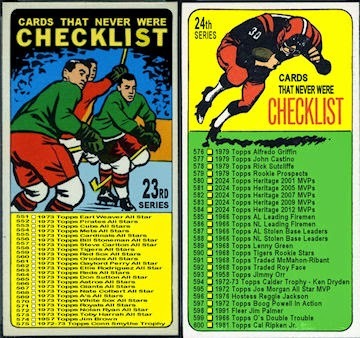 This set had short-printed, unnumbered checklists inserted randomly into packs. 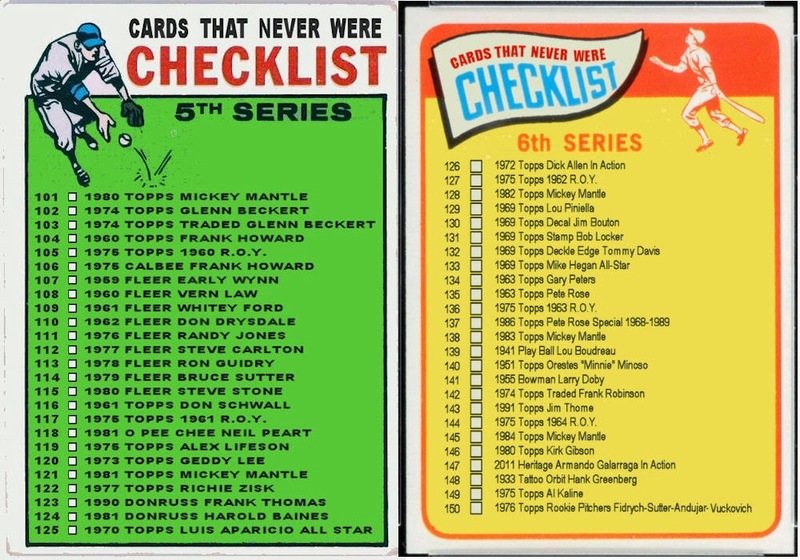 These were nice looking checklist. The fact that most kids used them for their intended purpose coupled with their short print runs make unmarked versions extremely rare and expensive. 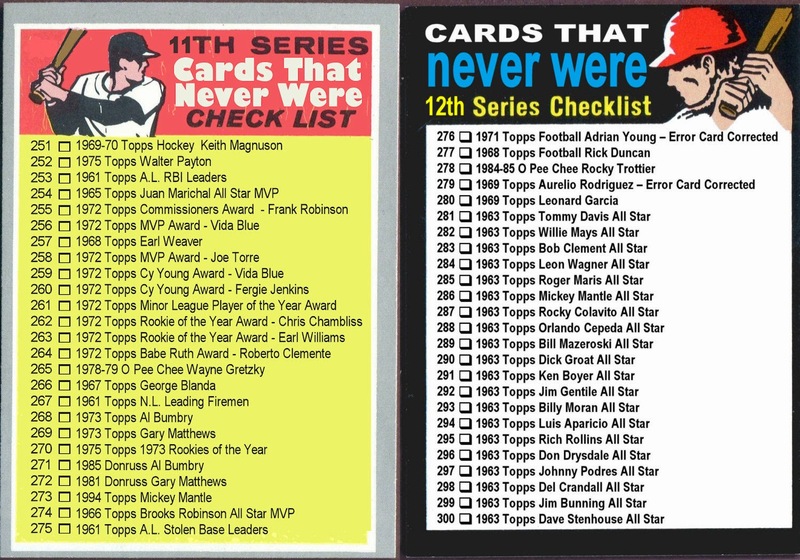 The bulk of the cards on this list are from the 2014 Post Season. I also made a few cards of my fantasy football team. 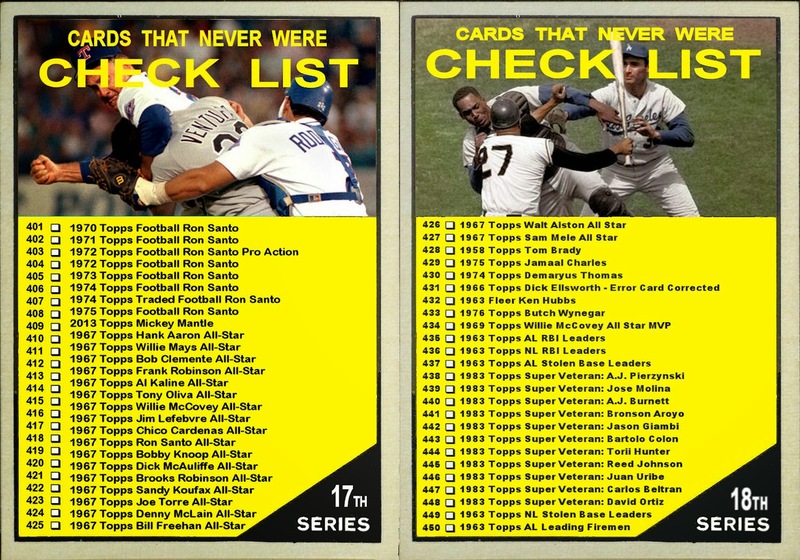 If you want to see all the cards on this checklist in one place click here.